Solutions for Domestic, Commercial and Profesional environments. Domestic/Commercial: Designed with both the pest management professional and the end user in mind, our range of flying insect management systems are so powerful and compact, offering protection far and above their size. Tool-free maintenance with a choice of either wall-mounted, ceiling-suspended or freestanding options; these units are ideal for smaller facilities, shops or even for domestic use. 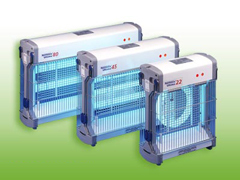 Professional: Professional Electric Fly Killers offer the ultimate control, complying with the exacting standards of the food industry. Features: unique transformer to minimises shattering of insects, hands-free guard opening for easy service, 'power-on' and 'grid-on' warning lights and inspection at a distance. Contact us today to discuss your requirements.